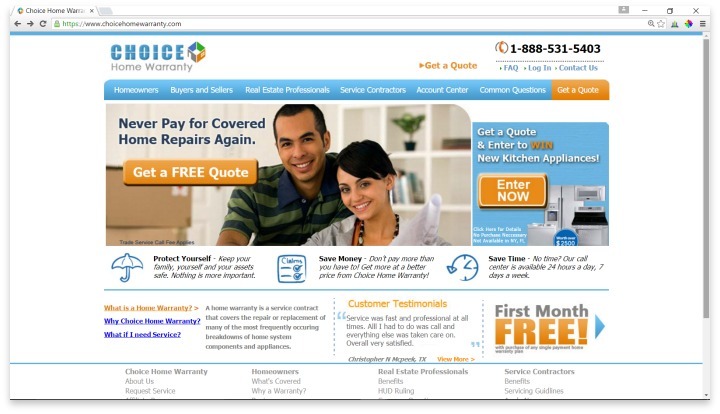 Choice Home Warranty is a home warranty provider based in New Jersey. Although they’re located on the East Coast, they provide the service to homeowners nationwide. Choice Home Warranty plans cover appliances and systems in the home. To qualify for coverage, the item must be in good working order on the day coverage is activated, should receive regular maintenance, and any issues that come up must be from normal wear and tear. Choice Home Warranty has two plans, plus optional add-on coverage for various systems that may be found around the home. The Basic Plan covers heating systems, electrical systems, plumbing systems and stoppage, water heaters, whirlpool bathtubs, ovens, ranges, stoves, cooktops, dishwashers, built-in microwaves, garbage disposals, ductwork, garage door openers, and ceiling and exhaust fans. The Total Plan provides coverage for everything in the Basic Plan, plus air conditioning systems, refrigerators, and clothes washers and dryers. Additional coverage can be provided for pools and spas, well pumps, sump pumps, central vacuums, limited roof leaks, septic systems and septic tank pumping, second refrigerators, and stand alone freezers, for an additional premium. When it is found that an appliance or system cannot be repaired, Choice Home Warranty will try to replace it with the same model. If that model isn’t available, they often cut the homeowner a check in the amount Choice Home Warranty would normally pay for the unit, which is often less than the retail price, so there may be extra cost associated with replacements, even if they are covered by the warranty. Many of the complaints consumers have about Choice Home Warranty is the company’s proclivity to deny claims. Some policy holders reported having their claims denied due to Choice Home Warranty saying the damage was not due to normal wear and tear, yet the service technician who came to diagnose the problem stated that it was due to normal usage. Consumers also report being denied access to a complete list of what is covered, and what is excluded, before purchasing their plan. Only after making the first payment were they provided with this information. Choice Home Warranty does have a 30-day risk free guarantee, so it leaves policy holders enough time to inspect all documents before the period is up. Another glitch in the Choice Home Warranty contract is their view on pre-existing conditions. There is no home inspection before a contract is in place, and the contract says both known and unknown pre-existing conditions disqualify the item from warranty. This can easily be used to deny claims, even those that are valid. Choice Home Warranty plans cover appliances and systems in the home. They have two plans, plus optional add-on coverage for various systems that may be found around the home. Choice Home Warranty can be a good option for some homeowners. The biggest complaints seem to be of misdiagnosed issues, denied claims, low payouts for replacements, and problems with contractors. A good time to buy a home warranty is right after a home inspection is completed. This would help the consumer’s case in the event a claim is denied. Also, consumers should research the contractors available in their area that work with Choice Home Warranty to ensure a wide range of workers who can finish the job. Have you had an experience with this company? Please share your Choice Home Warranty reviews below. Choice Home Warranty is a home warranty provider based in New Jersey that provides their services to homeowners nationwide.